OK, so calculus may be a slight exaggeration. But our Corgis were superb tutoring assistants for 5th grade math this spring! 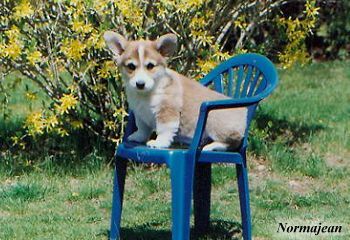 Corgis are excellent for schoolwork since they are small and lively, plus very smart and cute. Students did not feel threatened by them at all. Our school was on a contingency budget this past year, which meant the loss of many teaching positions, including the remedial math teacher for the elementary school. Since I enjoy math, I offered to tutor students with problems in math. I started with one student and ended up with 3 wonderful young men. One of the most difficult parts of tutoring students who are having trouble with a subject is getting them motivated and interested in the subject. It is also important to have the students focused and keep them calm when they get frustrated. Emotional control is important for learning and not easy to maintain when you feel frustrated and upset trying to learn difficult concepts. Both of our Corgis, Susan (CH Hungry Heart O’Culdi CD HS AX AXJ) and Flash (Culdi’s Hearts on Fire PT) are certified by Therapy Dogs International. They belong to my children, Tom and Kate and are incredibly “kid proofed.” The school was comfortable with them coming since they were certified (which includes insurance coverage). Both dogs have done numerous nursing home and school visits and demonstrations. It didn’t hurt that both dogs are very well trained and cute to boot! The Corgis proved to be invaluable. The rules were quickly established that IF you worked hard and concentrated on the work you were allowed to walk the Corgis through the school hallways to the room where we worked and then after the lesson, you got to make the dogs do their tricks and possibly do a presentation for your class with the Corgis. Naturally, a Corgi or two walking through the halls attracted plenty of attention and this helped the boys to feel important as well as doing the presentations for their class. While we worked the Corgis were supposed to lie quietly by us. Sometimes I have to admit they carefully vacuumed the floor or sat on their own chairs watching our work. If one of the boys started to get really frustrated, I would hand them a dog, say “Pet the dog for minute and then I will be right back to help you some more.” It was amazing to see how just holding and petting the dogs calmed the boys down. They could then go back to work and concentrate and work through the problems. All of the boys showed improvements in their math - learning the multiplication tables, one of them passing math for the first time ever and understanding and improving their math knowledge. When we had a pizza party at the end of the year to celebrate their accomplishments, Flash and Susan attended too. I asked the boys to write up short essays on working with the dogs and I have included them below. Working with the dogs with Mrs. Eldredge was fun! They helped me a lot. It got me to get going on my work because I was eager to play with Flash and Susan. One day we had a pizza party because I studied my multiplication facts. I had a great time. I also work with John and Chad, my two good friends. They helped me too. We got to take turns walking the dogs. Mrs. E gave us a cool pen, a notebook and the books Hatchet and Brian’s Winter. I am in 5th grade now. It’s hard work in 5th grade. Mrs. E, John, Chad, Flash and Susan made it easier to me. Now when I go to 6th grade I don’t know what I’ll do without them. Working with Mrs. E was fun. She made me know that I can do it, I can pass. She always said the dogs were helping me, but I knew it was her. Mrs. E taught me many ways to make my work easier for me, although it seemed like her dogs, Susan and Flash were trying to help us too. Thanks Mrs. E.
Working with Susan and Flash has been a great opportunity. Most people might think that dogs are stupid but they’re not. Flash and Susan can answer 2 or 3 math problems like two plus three, they would put up one paw in the air. Working with those two dogs was great but I would like to thank Mrs. Eldredge bringing Flash and Susan in. I thoroughly enjoyed working with these students and felt that we made faster progress due to the presence and assistance of Flash and Susan. I am sure we will be back to work in the fall - the three of us have studied the 6th grade math book this summer!